International property developer, Strawberry Star, will preview a new London residential development at the St. Regis Hotel, over the weekend of Oct 13 and 14. The development is called South Quay Plaza and is developed by UK property developer Berkley Group. The development is in the Canary Wharf neighbourhood and comprises three towers. The tallest is the 68-storey Valiant Tower, followed by the 55-storey Harcourt and 36-storey Burlington Towers. Strawberry Star will help launch five apartment units on the 64th floor of Valiant Tower at the preview. They are the highest units before the penthouses and are larger than other units on the lower floors. Canary Wharf is expected to witness the highest house price growth of 22.7% from 2017-2020, and now is the most appropriate time to invest in a residential asset in the neighbourhood considering the long-term gains, says Doris Tan, regional director at Strawberry Star. Residents of South Quay Plaza will also become members of The Quay Club, a private members club offering five-star facilities including a 20m pool overlooking London’s South Dock, a health club and spa, a gym and treatment rooms. Facilities in South Quay Plaza include 24-hour concierge, on-site security, CCTV, electrical car charging points, a bicycle storage, and a new dockside promenade with bars, cafes, shops and restaurants. 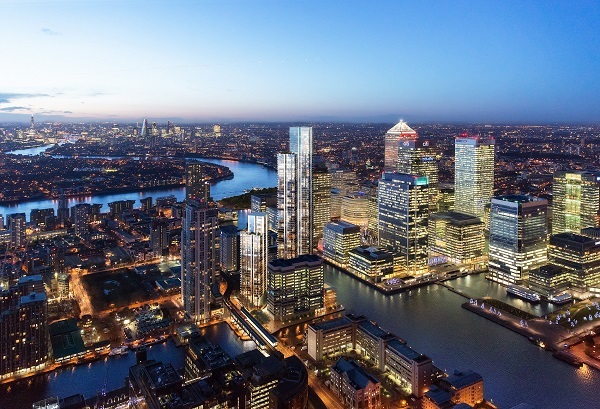 South Quay Plaza is 500m to the Canary Wharf underground station on the Jubilee line, and a new pedestrian bridge will also connect it to the Canary Wharf Crossrail station.